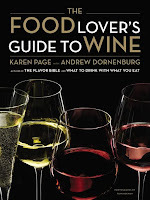 I have had my eye on Karen Page and Andrew Dornenburg's Food Lover's Guide to Wine since I first spotted it in the Little, Brown catalog several months ago. After a chance Twitter conversation with the authors, I was lucky enough to have received a signed review copy. 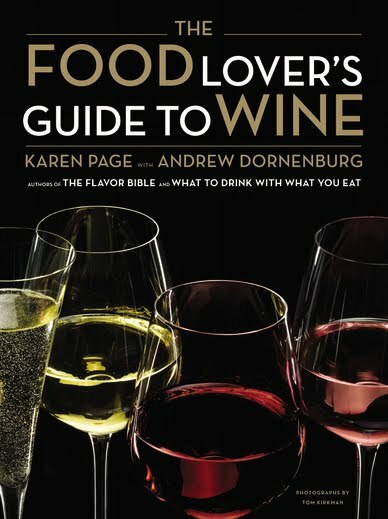 I am so excited to introduce you to The Food Lover's Guide to Wine because it is just the type of book my husband and I have been looking for. We own several wine books and most are one of two types: lists of wines with ratings or a detailed explanation of wine regions, history, and vineyards. Nothing ever seemed useful for two people who enjoy a glass of wine with dinner and want to know more about what they're drinking and what to buy. I knew I was in the right place from the very first page, the very first line: "Drink wine. With food. Not too much." Yes, the nod to Michael Pollan is absolutely intentional and sums up Page and Dornenburg's own philosophy. Their wine book is a no-nonsense, easy to understand, and informative guide to figuring out which wines to buy or order to fit our own tastes and the food we plan to eat. Our journey to confidence starts with talking to famous sommeliers. Wine experts from stores and restaurants around the world share their stories and tips in a conversational and decidedly non-snooty style. The authors ask the questions for us and then share the answers--for example: Is there a wrong way to enjoy wine? How do we learn what we like in a wine so we can find more of the same? We also get terrific tips on how to think about wine and learn to truly appreciate it. For example, we're advised stop to notice the color and aromas before we sip. Then we should take a sip and try to identify the flavors. Very simple habits can increase our enjoyment of wine and open the door to new discoveries. The authors address the questions of decanting, glassware, serving temperature, and other wine mysteries and never, ever make us feel as if they were talking down to us. Instead, we, Page, Dornenburg, and the sommeliers are all in this adventure together. Everyone has more to learn. What I love best about The Food Lover's Guide to Wine are the many charts, sidebars, and boxes for quick information. We can see at a glance a chart on the language of wine so we can better talk to a merchant or sommelier, a listing of 152 wines under $15, a guide to picking wine by style, a comparison of Old and New World wines, four things to know about Italian wines, how to read a wine label, and much more. In addition, there are dozens of tips and personal notes from wine experts to help us get a better feel for how to enhance our meals with a complementary wine. At the heart of the book is a large alphabetical listing. But Page and Dornenburg's list is not set up by wine label; instead we look up wines by more general terms. For example we can look up wine by grape, region, country, season, and acidity. There is even listing for boxed wines. For each item we find information about sweet/dry, flavors, serving temperature, food pairings, tips, and producers in an easy-to-use format. What's great about this list is that it will fit everyone, from experienced wine taster to those just starting out. If you're new to wine, you can skip right to serving temperature and food pairings. If you want to learn more, you can linger over the entries on sweetness, acidity, flavors, and texture. When you go to buy, you'll want to check out the producers. Another plus is that vintages are not listed; this is not a book that will be out of date next year. The authors absolutely discuss vintage and how the growing season affects the quality of wine. But instead of recommending a vintage that will soon be impossible to buy, they concentrate on the grape and the winemaker. This information will help us make an informed choice no matter what the year. After the master list, the authors delve into specific pairings by course and main ingredient. Here we find sane, usable advice on picking wine for salads, seafood, steak, pasta, game, cheese, and dessert. They offer simple ways to make quick pairings (the darker the food, the darker the wine) but also discuss reds that go with fish and whites that go with steak. It's important to realize that Page and Dornenburg's earlier book, What to Drink with What You Eat, focused on specific, detailed pairings. The purpose of The Food Lover's Guide to Wine is to help "food lovers along their journey of discovering wines and expanding their enjoyment of them," whether we're looking for everyday table wines or something for a special feast. There is so much more to this book than I can write here. I have four pages of notes and a ton of sticky flags marking pages. The Food Lover's Guide to Wine is a book that I'll use and read over and over again. It's the best wine book I've seen that is specifically geared to foodies, and I love that it offers layers of information so I can I get more out of it as my wine knowledge increases. Cheers! I am so glad that my neighbours internet hold up so I can participate this week! I personally don't like this taste of wine much, or most alcoholic beverages tbh. I tried some berry wines when I was younger. I was allowed by my mom to have a glass occasional. But it never really caught my fancy. hey, my post is about wine too. sort of. You just did some of my Christmas shopping - this is the perfect gift for friends of ours! Definitely adding this book to my Christmas wish list. Thanks for the review! This would be the perfect gift for my son-in-law. 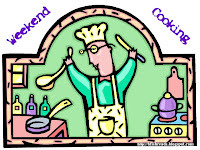 Have a great week, happy cooking, drinking and reading! No wonder you wanted to gush.... this sounds like the PERFECT book! I should get a copy for my husband (need to have it in my house) and one for my sister, too. I know several people for whom this would make the perfect holiday gift. I like the fact that this is a book that can be helpful for wine lovers of all levels of knowledge and experience. Oh how I wish I could enjoy a glass of wine here or there. But at least a book like this would do well to help with gift giving too! This is going on my holiday gift list right NOW! Thanks for sharing the video too, I enjoyed it. "Drink wine. With food. Not too much." This advice sounds like the Waverly Root approach in his book The Food of France. Wine is all about food. Otherwise you might as well drink whiskey. Sounds like an informative book with enough information that is applicable no matter where on the globe you live. I mostly only drink whites, and am happy with that. Every now and then, I'll try new wineries and new countries. Can be fun specially when you find a new treasure. This sounds like a magnificent book! I love that it's so helpful and that it gives so many ideas and tips! Sandy would love this one. I am lucky to have a very good friend who is a sommelier, and he is always giving me wine advice and sharing his knowledge with me. Often when I talk to him, I am amazed at how much there is to truly know and discover about wine! This is the book I've been looking for. I don't care for wine alone as a beverage. (I know - I'm living out here in wine country!) But - pair good wine with good food and I love it. Great review. Thanks for bringing it to my attention. I think I'd like this one! I am only just beginning to enjoy wine more and more. Thanks for the review! I like wine, but I like sweet wines - so perhaps this would be a good book to find the ones I like! Also oldest son would love this!! Sharon: exactly. This book is all about wines for everyone, every taste. I absolutely know what I'll be getting my stepmom and dad for Christmas now! AWESOME!! I devoured every word of your review and it sounds amazing--might even pick up a copy for myself as well. I love wine but don't know very much about it. Don't know what to buy, what to pair it with and have very little confidence serving it. This may be a book for me-I am a wine neophyte and sometimes wish I liked wine more to match it up. I love the nod to Michael Pollan! This sounds like a perfect book for my husband. I know what I like, but he's more into discovering *why* he enjoys a wine (and the commonalities with other wines). Thanks for the tip. I have several family members that would love this book under their tree. The nod to Pollan's advice gives me a good feel for the author's intent. Sounds like a fantastic resource. I'm always looking for things that can help me expand my rather patchy knowledge of wine. I sometimes think I would be more of a wine person if I knew where to find good wine. Back in 2003, Jason's employer hosted a couple of business men and women from Eastern Europe, and we hosted one of them in our home for two weeks. He was from Hungary, and he brought us a bottle of dessert wine from his home town. It was delicious, the only kind of wine I've ever liked. I love the nod to Michael Pollan. I am not a big wine person, my hubby is, but I find it bitter... although it looks so pretty in a glass I cant resist - and I do try. Good morning, this week seeing a not so old photo I took brought back a childhood food memory .. its all good! Thanks again Beth for doing this post! It's my favorite! What a great review. I'll be adding this to my Christmas list. Thanks, Beth! This book would be a great Christmas present for a friends who love good wine and food. I know someone who would love this book for Christmas. Thanks for sharing it with us. I was at a loss of what to buy this person! They will love this book! This book sounds so right for me. I have the "two types of wine books" and really, they haven't helped me much. I learned more talking to wine sellers than reading! Sounds like the perfect book companion for a wanna-be wine-o like me. Thanks! Nice review and sounds like a very useful book. I know what kind of wines I like and usually buy the same ones unless I'm at a tasting and then I'll buy something new. Most of my information comes from the wine reps.
Learning more about wine has been a focus of my reading since early summer when I was trying to learn how to buy a bottle of French wine when I traveled to Paris (I still struggle with those appellations and reading the labels). I returned to the states with an even great interest in learning about wine and how to buy it, appreciate it, and pair it with food to bring out the best flavors of both. This books sounds PERFECT and I plan to see if my local library has a copy today. And if it doesn't? I just may have to buy myself an early Christmas gift. Four pages of notes? I am VERY excited. I love wine. I love food. Sounds like a perfect book! Really it is my husband who would love it. He's the sommelier at our house. Thanks for the tip! I just had to let you know that because of this book review I received this book from brother for my birthday! I put the book on my wish list and received it this week. I am anxious to pour over the pages over Christmas break.